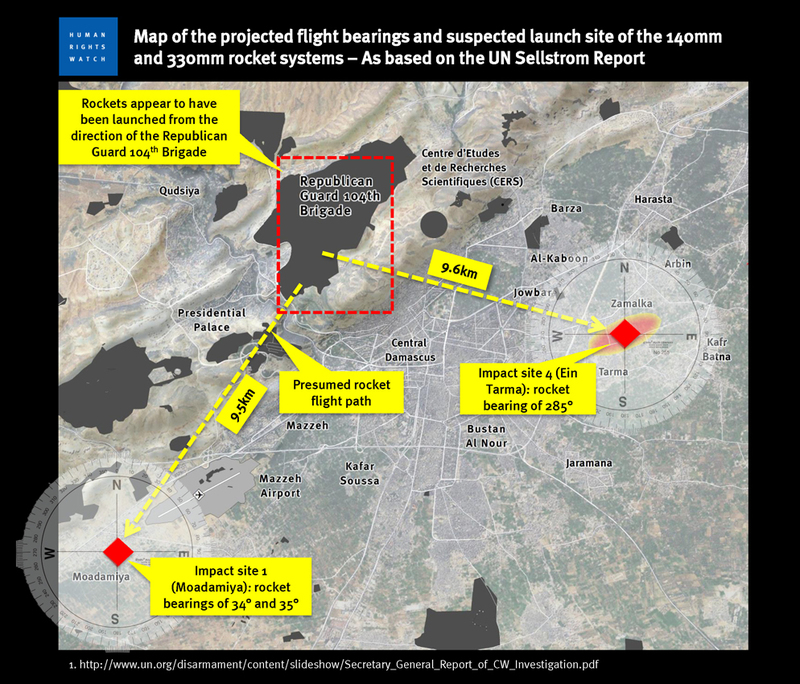 Key evidence about the range of the rockets allegedly used by the Syrian regime in the chemical attacks on 21st August in East Ghouta, which was first published by Human Rights Investigations (HRI) yesterday, indicates that widespread statements made by Human Rights Watch (HRW), government officials and the mass media about the attacks are erroneous. A video this writer discovered on YouTube shows clearly, for the first time, the launch and explosion of a HE version of the ‘Volcano’ – the kind of rocket examined by UN inspectors in West Ghouta. The important thing about this video is that it allows us to estimate the range of this kind of weapon and corroborates a detailed investigation using rocket modelling techniques on the ‘Who Attacked Ghouta’ website. This means that the rockets which were allegedly fired on 21 August would have had to be launched from inside disputed territory, from areas in which Syrian government forces have only a limited presence. This does not prove that the rebels fired the rockets allegedly used on 21st August, but it does indicate that many of the statements used to place the blame for the alleged attacks and encourage an attack on Syria are erroneous. It has been widely held, in large part due to the concerted efforts of Human Rights Watch, that rockets were fired from a government military base 9.6 km from the suburb in which they are alleged to have landed. The report, however, provided data that suggested the chemical-loaded rockets that hit two Damascus suburbs were fired from the northwest, indicating they came from nearby mountains where the Syrian military is known to have major bases. Mount Qassioun, which overlooks Damascus, is home to one of Assad’s three residences and is widely used by elite forces to shell suburbs of the capital. The powerful Republican Guard and army’s Fourth Division, headed by Assad’s younger brother, Maher, has bases there. According to The Associated Press, Ake Sellstrom, leader of the UN/OPCW team investigating the attacks said the team will evaluate “allegations of chemical weapons use from both sides, but perhaps mainly from the Syrian government’s side.” saying he didn’t think there was a need for more investigations of the Aug. 21 attacks, but saying “if we receive any additional information it will be included next time we report.” He has now been provided with plenty of additional information. Intelligence, including satellite detections, also indicated that government forces had fired rockets and artillery shells from a government-controlled territory towards the suburbs where the chemical attacks occurred, the White House said. One of the most damning details from the United Nations investigation has to do with where the sarin-filled artillery shells appear to have been fired from. They appeared to sail in from the northwest – from a part of Damascus that just happens to be tightly controlled by Syrian regime forces and to contain a large Republican Guard base. Human Rights Watch, which conducted its own investigation that concluded that the Assad regime was likely responsible, actually put together this map of the attacks based on the U.N. data. It seems to point pretty squarely to the Assad regime. Our readers will doubtless be able to find numerous similar examples in the media and from government officials. Although the social media investigation into what really happened on August 21st goes on, and we hope Professor Sellstrom will produce a comprehensive report on December 13th addressing all the many outstanding issues, it is clear that the world’s public has been greatly misled. Readers of this article could contact the media outlets spreading misinformation (often aimed at encouraging military intervention) to ask them to issue corrections to their reporting. This is most likely to be successful with public broadcasters who are bound by stricter reporting rules. Supporters of Ken Roth’s Human Rights Watch should discontinue that support as the organisation produces misinformation to support military intervention. * which holds government, media and the large human rights organisations to account. The kind of research this article is based on is quite time-consuming but frequently reveals information of significant value in understanding human rights and peace issues. 8 responses to Key new evidence reveals fundamental error in Human Rights Watch, media & government statements over Syria chemical attacks. Reblogged this on narwhal8915's Blog. Incidentally in that blog post he also calculated a Northerly trajectory which he has now silently dropped in favour of an Al-Jazeera one to the Northwest. Hi Charles – nice to see you here! By the way, I’ve posted on whoghouta links to a CIA disinformation exercise published on August 21 – i.e. on the same day the attacks occurred. Basically they claimed the missile attack was done from “A Telecommunications factory” in Qaboun and from Baghdad Bridge using a total of four 122mm chemical warfare rockets. The press release was by the “Syria Support Group” which is the US NGO tasked with supplying non-lethal aid to the FSA – i.e. a CIA front.